In 1912, two stars were added, representing Arizona and New Mexico, bringing the total number of stars to 48, arranged in 6 rows of 8 stars each. There were thirteen stripes representing the thirteen original colonies. This flag flew from 4 July, 1912, to 3 July, 1949. 0n 14 February 1912, following admission of New Mexico and Arizona, President Taft approved a Joint Army-Navy report recommending that the 48 stars be arranged symmetrically in six rows of eight stars each. Unfortunately, the page does not provide the size of the star and their placment, which I do believe the EO did do. I believe that flags of this design were manufactured in or shortly after 1912, but have been unable to pin down the date with certainty. I have seen a postcard with a flag of this design dated as late as 1920. The staggered 48 flag was produced in pretty fair numbers from 1912 at least up through the end of World War I. My grandfather came home from France with a 2x3 foot linen staggered 48 attached to a wooden staff, much like what anyone can buy today at your local school supply store in the states. This arrangement represents a staggered 48 star horizontally inverted from the first one that I posted. I saw a picture of this flag in a poster on e-bay. I have no idea if such a flag was ever really manufactured. The first flag raised was an ensign from the USS Missoula measuring 28" x 54". The second flag was an ensign from the LST-779 measuring 56"x 96". See also: www.iwojima.com which is perhaps the definitive website on the flag raising. The second Iwo Jima flag was in fact a battle ensign from USS LST-779, which had been beached near the base of Mt. Suribachi. On 23 February 1945, a 40-man detachment from Company E, 28th Marines, commanded by Lieutenant Harold G. Schrier, was sent to scale the mountain (actually a dormant volcano). The Marines made it to the rim of the crater, where they engaged in a brief but intense firefight with the last surviving Japanese defenders. At 1020 AM, while the firing was still going on, one of the Marines picked up a 20-foot length of pipe that he found lying on the ground, lashed to it a small American flag that he'd brought in his pocket, and raised it. This flag was too small to be seen through the smoke of battle, but the ensign from LST-779 was already on its way up, carried by another Marine. An Associated Press photographer, Joe Rosenthal, arrived at the top just in time to take the famous photo of the second flag raising. The oft-repeated story that the second flag raising was posed for the photographer is not true, by the way; Rosenthal just happened to be in the right place at the right time. He received a Pulitzer Prize for his photograph. In high school a friend of mine told me that his father raised the flag on Iwo Jima. I thought he was pulling my leg but went along with the gag. Which guy in the statue is he? I asked. No, he replied the statue was the second raising. Dad put up the first. I continued to think he was just spinning a yarn until a few years later during the 25th anniversary of the raising the local TV stations interviewed a "local man who raised the flag on Iwo Jima" It was my friends father! OK, I thought, he wasn't pulling my leg after all. Here's the scoop. The first flag raised was just a small flag one of the Marines was carrying (probably about 5 feet in length). This act was photographed (which is how Mr. Lindberg, my friend's father, is able to verify his claim). Later the Marines sent the famous group up to raise a larger flag. So yes, it was the second raising, but not for the express purpose of taking the picture. I am researching the origin of a 48 star flag I have. This flag appears to be made of linen fabric, hand cut in two pieces stars and sewn. The blue portion is very dark Navy Blue which is almost black. The identification of the edge band has two navy anchors. These anchors do not have indication text such as USN. The name stenciled on the band is "DREADNAUGHT". The size is 5 x 8' with a small prefix of "E" before the 5 x 8 stencil. (note the spelling, "A" not "O"). I have researched the H.M.S. Dreadnaught, in the registries of British ships of war and the U.S. ships of war. There are only 2 commissioned ship with the name Dreadnaught. Both are British, The Battleship commissioned in 1903 and the Nuclear Submarine commissioned in 1960. The Sub would not have carried a 48 star flag and so I am left with only the Battleship. HMS *Dreadnought*, commissioned in 1906, gave its name to a new generation of battleships on account of its revolutionary features: an all-big gun armament, centralized director fire control, and turbine propulsion. This ship is generally held to have sparked the Anglo-German naval arms race because it rendered all previous battleships obsolete at a stroke. This presented Germany with an opportunity to negate British naval superiority by building up a dreadnought battle fleet. It's interesting that the name is spelled "Dreadnaught" on the flag in question. This is clearly incorrect. I might also note in passing that the 1906 battleship was not the first British *Dreadnought*. A turret battleship commissioned in 1879 and discarded in 1908 bore the same name, and I believe that earlier (eighteenth century) there was also a sailing ship of the line named *Dreadnought*. The probable answer is in the spelling. "Dreadnaught; a heavy woollen felted cloth used as a lining for hatchways on board ship." Entry from the Oxford English Dictionary quoting the 1870 Mechanics Dictionary. It doesn't sound as though dreadnaught itself would be a suitable fabric for flags, but perhaps the word at one time was generic for any hard-wearing material, or maybe a particular flag manufacturer had adopted it as a trade-name. Previous versions of US flags are used until worn out. The consensus is that all outdoor flags have worn out and been replaced, but you will, on rare occasions, see one indoors. One place that always flies a 48-star version, for obvious historical reasons is the reproduction of the US Marine Corps Memorial in Arlington, Virginia in Newington, Connecticut. The official U.S. Marine Corps Memorial in Arlington uses the 50-star flag, as shown at www.nps.gov/amme/marine_corps_memorial.html. Given the information below from Jim Ferrigan that 48-star flags appeared as early as 1898, I made a search of old newspapers available at the Library of Congress site chroniclingamerica.loc.gov. 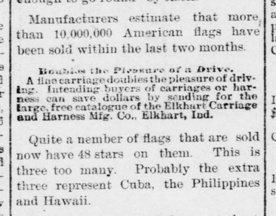 I found several references to 48-star flags in 1898, one of them is above (from Butler Citizen, Butler PA, June 30. 1898). Additional mentions of 48-star flags are made in various newspapers through the years prior to 1912, so it is indeed clear that some flag manufacturers made the flag that way, either to celebrate the new territories gained in the Spanish-American War, or to anticipate the statehood of OK, NM and AZ.